We’re big fans of slow cookers and multi-cookers here at BGR, mostly because they’re friggin awesome. They take so much of the hassle out of cooking, and food tastes better because the flavor is locked in. These wonderful kitchen gadgets come in all shapes and sizes, but cookers in the same price range tend to be pretty similar. If you’re looking for something special though, we’ve got just the thing. 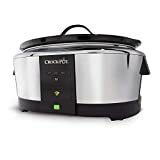 The Crock-Pot Wemo Smart Wifi-Enabled Slow Cooker lets you use the WeMo app on your iPhone or Android phone to monitor and even control your slow cooker from anywhere in your home, or anywhere in the world. Did you run out to grab wine and you’re wondering how dinner is doing? Easy. Want to turn up the heat a little while you’re in the backyard relaxing? It couldn’t be easier. It’s an awesome product, and it’s on sale right now on Amazon at a deep discount.